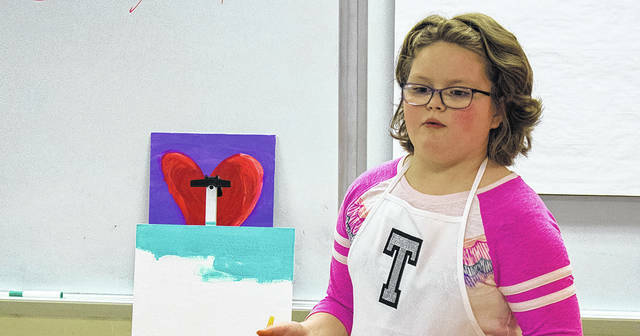 GALION — Teagan Prince, a third-grade student at Galion Intermediate School, has had a love for art and painting since she was two years old. She was given the opportunity to share her love of painting with her classmates, students in Mrs. Lesley Buzza’s third-grade class last Friday. Teagan and her mom Paula, a fifth-grade teacher at the Intermediate School, had all the painting supplies ready for two sessions with Mrs. Buzza’s students. The painting students first learned how to create the background for their individual masterpieces. Then, Teagan showed her schoolmates how to create the focal point of their paintings which was a heart since it was Valentine’s week. Teagan admitted that she was a little nervous when she first started teaching the painting class. Her confidence quickly grew, and the nervousness disappeared throughout both sessions. Paula, Teagan’s mom, was incredibly proud of her daughter as she watched her capitalize on this opportunity to share her passion and love for art. She attributes Teagan’s confidence to the growing culture of leadership at Galion Intermediate School. “Seeing first-hand what our Leader in Me initiative can do for students is unbelievable,” she said. “The confidence Teagan showed in herself and the validation of what she loves to do was monumental.